← Can ‘Les Revenants’ pull off the pay-off? Mind you, it’s not exactly easy figuring out why it is just so good either because it lacks so many of the ingredients that we have become accustomed to from our water cooler, tweet generating TV classics of the 21st century. 1. It is not great on the ear. There is no West Wing-to-and-fro tiki-taka to bask in. We operate in mono. A tight, taciturn, stilted script that has no codified drug talk, or gansta zingers. “Yo” does not a dialect make. The post-modern sci-fi musings of Jesse’s druggy mates are not Tarantino ironic and perceptive – just dull, really dull in fact. Lines stand out but only because of the brilliantly accumulated tension, not in their own right. The script is as visual as it is verbal; facial, unsaid, framed by either the home, the workplace, the lab or the desert. 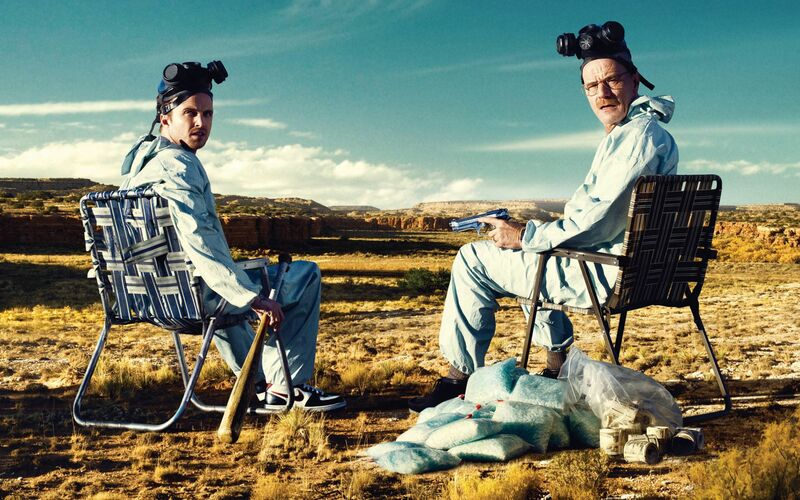 It is arguably the shows’ funniest ever line and a perfect example of Breaking Bad’s alchemic brilliance (warning – that’s not the only chemistry reference you’ll be getting). If you aren’t immersed with the world of Walter White, his cancer diagnosis and the Albuquerque Crystal Meth drug empire he built to fund his treatment, it is almost impossible to explain how this simple greeting is able to carry all the weight of the drama and character development that precedes it as well as the anticipation of what’s to come next. It is a perfect example of a perfectly timed and refined beat of a very confident and accomplished writing team. 2. There are no heroes. And the anti-hero has an unredeeming soul and is ugly. Remarkably a producer of The A-Team, Stephen J Cannell, has, albeit inadvertently, come as close as anyone to nailing the magnetic mystery of Walter White – a man who wears bad clothes and ugly underwear, says little, emotes less and contains all. The depiction of Walter White takes this theory and never departs from it. Walter White is not a Don Draper-like libido trigger. Draper is lazy, does a lot of bad things but always looks good. Walter White is no Tony Soprano. He too wrestles with the paper thin alibi of providing for his family as means of justifying evil but Tony demands affection. He is a man so in need of a hug that he would kill within earshot of his daughter but pass out worrying about migrating birds. Thankfully Walter White isn’t Hannibal either. His plans may always come together but he neither demands our lust nor our love, just our respect. And he has that alright. 3. You take no sides. There are so few good decisions made by the show’s main characters that the idea that Breaking Bad is a morality play doesn’t stack either. For that to be the case there has to be good contesting evil. There isn’t. There are agents of wrong and their victims. We only root for the victims out of a sense of natural justice, despite their flaws and weaknesses and not because of their strengths. They are petulant, brash, naïve, childish or just actual children. There are no heroes, no Bartletts or Bunks. Only briefly are you on Walter’s side. The initial justification for his career switch from put-upon high school teacher and breadwinner to fearless drug baron soon ebbs. He makes the bad calls so easily and so often and is so violently repellent we can begin to question whether the traditional arc of a good man gone bad is happening at all. Instead, are we merely watching a bad man finding his calling? Yet we somehow remain implicated and willing his success. Like his wife, he is our companion and without him the story ends and we want it to continue, so we want Walt to continue. 4. It is not an unveiling of a truth. It is actually quite ridiculous. Yet never feels it. Walt’s inexorable rise simply could not and would not happen on any kind of closer inspection. It is fantastical but it is counter balanced in a carefully selected palette: bad pants, (did we mention the bad pants before? ), bland clothes, homes either poorly lit and drably decorated or in just plain bad taste. Brown hue or preposterous purple. There is no West Wing pomp; Soprano’s kitsch or Mad Men chic. It is neither hipster ironic nor cover shoot cutting edge. It is just naff. And behind this naff, the preposterous goes unnoticed and quietly about its business, hiding in the plain suburban sun. 5. It may be ridiculous and yet it is predictable. Its secondary characters, essentially all of Walter’s advisories, are a procession of malice, an upgrade on his last, recently defeated nemesis. Downfall is foreshadowed powerfully each time, and each time more extravagantly overcome but yet with each series we fall for it all the same ,all over again, left open mouthed as Walter defies logic and gravity. It has a computer game logic. Each level of evil harder to acquire. Appropriately the last of his challenges are those closest to him. As his empire expands to breaking point and he retires, his world shrinks and hones in on the actual war raging throughout and not the individual battles that comprise each series. It has always been a war between Walt, his family and Jesse. So if Breaking Bad contains no charisma, no heroes, no great dialogue, has no agenda, and is quite staggeringly daft, just why, why is it so good? Breaking Bad is a brilliantly aligned compound of the necessary elements of TV storytelling – character, setting, pace, structure, a tight aesthetic, its own visual language and an ever present, ever escalating jeopardy. It is resolutely free of any background noise that poster boy good looks or a political agenda could bring. In being so conspicuously absent of the hooks normally expected of modern TV drama, Breaking Bad appears to be an exercise in the nothing more, nothing less perfection of a great story – a 98% pure product that Heisenberg himself would be proud. This entry was posted in TV, Uncategorized and tagged Breaking Bad, Bryan Cranston. Bookmark the permalink. Best Breaking Bad review I have read. The mindless praise has gotten to be a bit much, but you get to the flaws fo the show and how it ulitmatly transcends it.